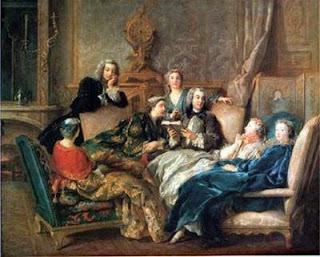 Long before there ever was a TMZ, People or Page Six, early 18th century scandal sheets fed the reading public's insatiable appetite for gossip. 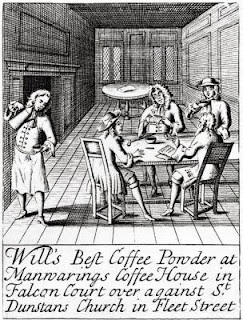 Readers, mostly in London, went to their coffee or chocolate house to find issues of their favorite tattling periodicals and there read about and discuss the scandals du jour. Newspapers were a relatively recent phenomenon, and expensive. Not many could afford to have them delivered to their homes. 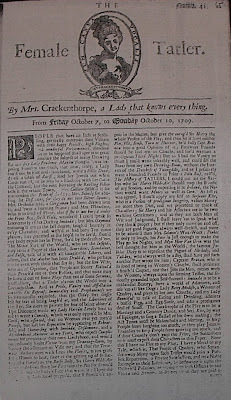 To catch up on the latest gossip, men went to public coffee houses and gaming clubs, and women visited India Houses (tea shops with a considerable amount female customers), and there, over revivifying beverages, they could chat with friends and read about the scandalous events amongst London's elite. Just like today, when we have a huge range of tabloids to choose from, the Londoner in search of scandal had a range of rags and broadsheets, including The Tatler [sic], The Flying Post, The British Apollo, The Observator, and The Female Tatler. Some were published for years. Others folded within weeks or months. The periodicals were themselves the subject of scandal, such as The Female Tatler, whose authorship by "Mrs. Crackenthorpe" was debated, and, for a time, there were two Female Tatlers, each claiming to be real. 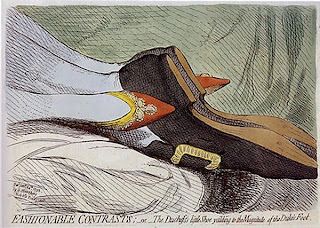 When we daily hear of unaccountable whims and extravagant frolics committed by the better sort, we must expect those of inferior classes will imitate them in their habits of mind, as well as body, and the only way to correct great men's foibles, is handsomely to ridicule 'em; a seasonable banter has often had a reclaiming effect, when serious advice from a grave divine has been thought impudence. No doubt this is a case of protesting too much. As soon as people stop misbehaving, then there is nothing left to publish, and the tabloid folds up shop. And besides, reading about scandals is just plain fun. ...do but observe Clarissa the next time you see her, and you will find, when her eyes have made their soft tour round the company, she makes no stay on him they say she is to marry, but rests two seconds of a minute on Wildair, who neither looks nor thinks on her, or any woman else. Other tasty morsels include Mrs. Crackenthorpe's exposure of a certain "Beau Maskwell:"
...one of the walking gentlemen of the age; a person Sans Consequence, who every day makes his tour of public places with a kind of thoughtless serenity....who has studied Piquet more than Aesculapius ever did Physics, can slightly place the cards to his own advantage. In other words, don't take him up on an offer of a friendly card game, or find your purse lighter than before. ...Madam Slender-sense, who is lately fallen ill of a swelling she receiv'd by a slip the last ball night. Some are so rude as to say that Beau Garsoon, the French dancing master, was the occasion of it; and Mrs. Manlove, who generally searches into the bottom of such an affair, solemnly protests she saw them go up one pair of stairs together. What they did there, she can't tell, but the lady has been ailing ever since. And long before Mr. Blackwell had his infamous Best and Worst Dressed, list, 18th century broadsheets loved mocking over- (and under-) dressed people, especially women trying to look and act younger than they were. Mrs. Tawny alias Tawdry, is desired not to be so fantastically whimsical in her dress...nothing is more disagreeable and ridiculous than to see a woman of her years affect the gay, youthful airs of their daughters. And, by the by, she is reminded that if she will be so preposterously gaudy and flaunting, that if there was little more economy observed in her dress, she would not be altogether the subject of so much laughter. No matter the century, it seems scandal never goes out of style!